After 130,000 submissions and millions of votes were cast, teenager Sabrina Brady of Sparta, Wisconsin was named the 2013 U.S. Doodle 4 Google National Winner. 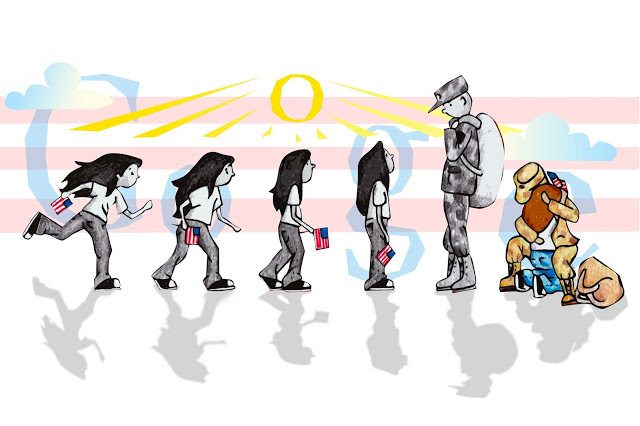 Her winning doodle, “Coming Home,” was featured today on Google. Here’s how I see it: A young girl has been waiting for her soldier dad to come home. She’s joyous and runs to greet him. But the closer she gets, the slower she goes. Until she stops. He looks different . . . changed . . . more serious than she remembers. He says something familiar and smiles, and she recognizes it IS him. He drops his bag, falls to his knees, and they hug like there’s no tomorrow. War does that, you know. Subtle, yet profound, changes show on the faces of returning soldiers. I experienced this firsthand during the Vietnam Era when the boys I knew came back changed men. Always hug like there’s no tomorrow. Sometimes there isn’t one. Google has taken its doodle to a new level for Charlie Chaplin's 122nd birthday.